Congressman Steve King releases the following video of remarks he delivered last night on the House floor on the subjects of immigration and border security. King is a nationally recognized leader on the two subjects, and a long time champion of building a Border Wall on the US-Mexico border. 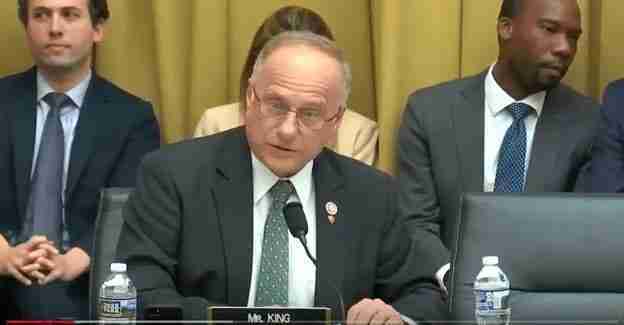 King’s remarks are especially significant given their timing, as the House is currently considering legislation which would grant Amnesty to millions of illegal aliens. Congressman King opposes Amnesty, and he opposes both of the bills the House of Representatives has scheduled for consideration this week and next as they contain amnesty provisions that would reward illegal aliens for having broken American immigration law to enter the country. King also notes that it doesn’t seem to bother the “hyperventilating” American left when abortion literally “tears a baby from its mother” or when children are separated from American parents because the parents have committed crimes. What’s really at play here? The left “wants to invite illegals into their cities for political power” and “see a political gain come out of promoting illegal immigration.” Sadly, even though this means exposing Americans like Kate Steinle and Jamiel Shaw II to an influx of killers from the most dangerous countries in the world, it is a price the left is willing to pay for power.